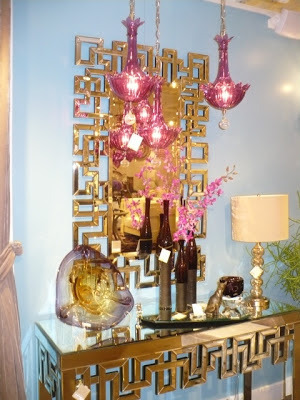 Many designers and bloggers report on current trends and you can see their take on the 2013 market on their blogs. In fact, you may have already noticed their photos from Dallas in the last 2 weeks. I am a little late in reporting! You will most likely find we all have a slightly different take on what we see but that's what makes it interesting. One thing I've been seeing in recent months--before I got to the Dallas Market----is the popularity of contemporary art. Most of these pieces consist of blues and greens, very similar to the one shown in the photo above. 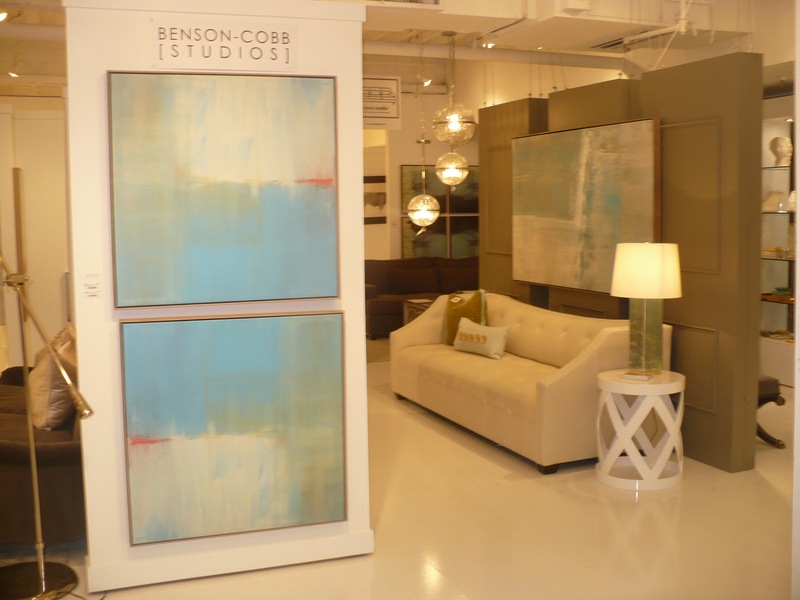 I think the lack of detail is part of the appeal, and the "less is more" attitude in some of today's interior design. What do these pillows and mirrored pieces have in common? I'm not talking color---yet. 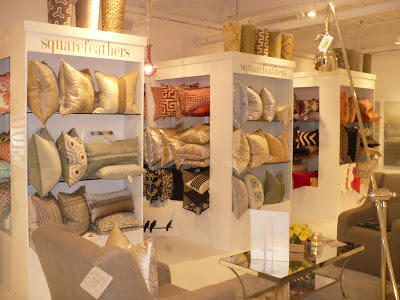 The geometric designs in the pillows and the table/mirror combo is something we saw throughout many showrooms. 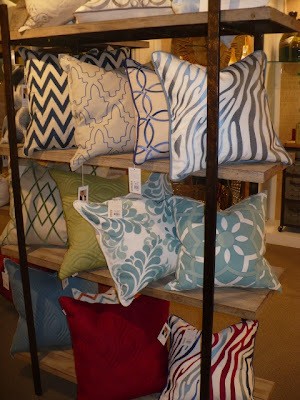 It seems those geometric patterns blend in very easily with other patterns, and don't seem as "fussy" as the florals and plaids we saw in previous years. Lamps and light fixtures are showing up in many shapes and colors. This show room, Robert Abbey, has always had a classy collection of light fixtures and this time we bought into it! Look to see some of their pieces in our shop in the near future. 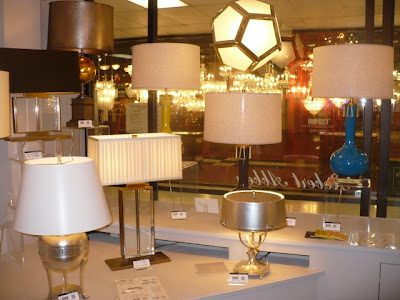 Notice the geometric designs showing up in these lamps, too! Navy and white has been around forever, but the patterns keep it fresh and new. 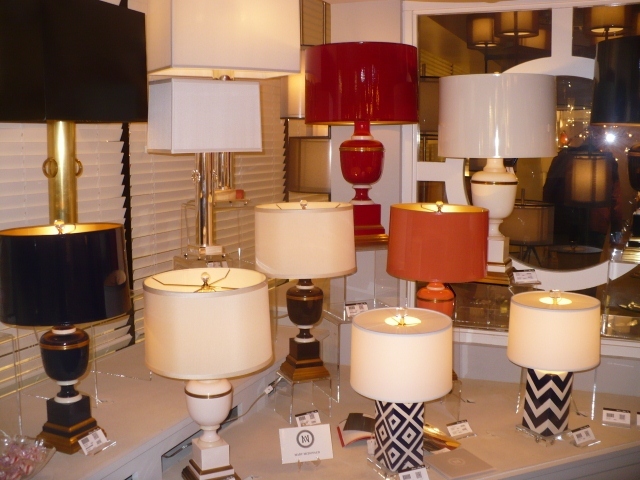 Mixed in with the contemporary are the traditional shaped lamps in lipstick red, bright orange, along with classic navy and white. Lots of gold and brass showing up this time, but not the shiny stuff from several years ago---more of an aged, matte finish. 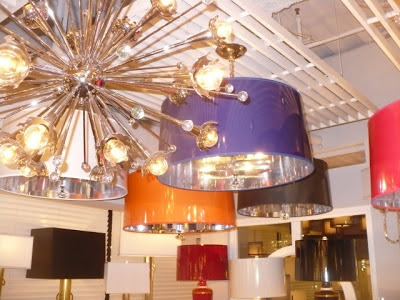 These ceiling fixtures aren't going to be boring! Look at the great colors in these drum shades. We'll tell you more about trends in a future post. You will want to see the colors that will be showing up in home decor. We've already incorporated most of them into our current inventory!